These are 5 words I never imagined I would hear directed at me. It’s still sort of unbelievable to think about it actually. The past 48 hours have been some of the most intense, emotional, rewarding hours of my life. I participated in an act of civil disobedience in front of the White House on Saturday along with 242 other people, which was organized to put pressure on President Obama to deny a permit for the Keystone XL tar sands oil pipeline. A total of 1,253 people were arrested over a 2-week period for sitting on the sidewalk and peacefully demonstrating in support of clean energy. You see, I feel so strongly about sending the message that humanity and the climate are under collective arrest by big oil and corporate interests that I’m willing to make a bold statement to show that people are willing to put themselves on the line over it. I rarely get blatantly political here, but this is no time to play it safe. I want my President to lead and do what he was elected to do – change things. For 3 hours on Saturday, I sat and waited patiently for my turn to be removed from the sidewalk and brought into custody. Across the street and behind the police lines, people cheered and clapped for every single person who was cuffed and hauled away. When I finally did get arrested and put in the police van, I was crammed into the back with other change makers from around North America. We shared stories of hope and inspiration as we sweated it out in the dark, dirty van. And I would do it again tomorrow without hesitation. 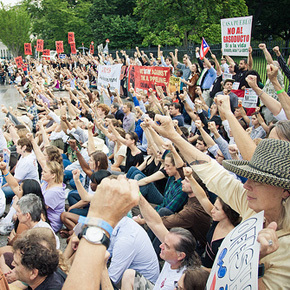 The journey to finding myself in handcuffs started a couple of years ago when I first heard about Keystone XL, but it was on July 1 of this year that a stark reminder of why the issue is so important came into focus. That day, there was a tar sands oil spill in the Yellowstone River in Montana, bringing the dangers of this energy source back to the headlines. 7-year-old Devon, my buddy from the ISF Kids Army, tweeted me and asked me what we could do about it. I knew instantly what we could do – stop Keystone XL from being built and prevent future spills in the American heartland. What has happened since is nothing short of mind-blowing to me! Devon went into immediate action and wanted to know who we should be tweeting and writing letters to. I spoke to Kim from IS Foundation about the issue, and she immediately jumped on it and made it a priority initiative. Since then, we’ve collected over 20,000 signatures on the Change.org petition and collected videos from youth around the world that are being edited together for a reel to be presented at the White House. This is what change looks like. Devon is a remarkable girl, and when I look at her and see her in action, I realize that she and others like her are truly the hope for the future. She exudes leadership and has amassed a following of kids from around the world that come together and speak out on issues that they believe in. She came to DC on Saturday to support the great work of the Tar Sands Action team and to witness this demonstration in progress. As Devon began to discover how many people were there to support this demonstration, she interviewed people, took photos, and cheered us on as one by one we were cuffed and put into police vans. She did a slide show about her experience, which you can view below. This is real. Very real. What you see below is literally through the eyes of a 7-year-old. I met so many incredible people through this experience, and feel that there is a sense of camaraderie amongst the participants that will only grow stronger as time goes on. We still have a lot of work to do on this issue, and if anything, I hope that more people will stand up, speak out, and urge the President to deny the permit for this pipeline and support the clean energy jobs he promised us back in 2008 instead. Devon asked me in her interview with me why I wanted to get arrested on Saturday. I responded that I would prefer not to have to get arrested, but I’m willing to take that step to show how much I believe in this issue. The words that keep ringing in my ears over this are: If not me, who? If not now, when? If I don’t stand up, then who will? If we don’t face reality and make a shift away from fossil fuels now, then when will we? We’re out of time, and I’m asking begging for bold leadership from President Obama. The kind of leadership that 7-year-old Devon displays. Please, Mr. President, do the right thing here and lead. Stand up to the pressure from the oil lobby and deny this permit. I want to say special thanks to Devon and her Mom Lainie for being there for me and showing such unwavering support on Saturday. Because of you, people around the world who had no idea what was going on now know about this issue. And thanks to my friend Jessica (one of the first people arrested on the first day of the demonstration) for talking me through the whole process and keeping my spirits high. There is an endless list of people to thank from the Tar Sands Action team and also from the ISF team, but I want to highlight two people in particular who have been incredible inspirations to me lately – Ian Somerhalder and Kim Klingler. Ian’s willingness to speak out on issues like Keystone XL is bringing an engaged audience of kids and youth to the table at a time when we need to hear from them the most, and Kim’s leadership at the IS Foundation is harnessing that energy into positive action that helps their voices be heard far and wide. Kudos, my friends! Finally, endless thanks to the 1252 other people that showed up and risked arrest over the past 2 weeks. I’m happy to be a part of this group of incredible change makers! For more information on the demonstration and the Tar Sands Action movement, click here. For information on the youth video initiative with the IS Foundation, click here. Will you join us and speak out?